18.10.2005 PEARL OF THE DAY №11: WHERE WILL MY PRANKSTER GALLOP? To be more expressive, I will cite other people. A lady in a bus reasoned with some drunkard, saying, «Got drunk, act accordingly!» In the rounds 9 and 10 Anand clearly showed that his ambitions are gone, so now he should not try to get crowned on the sly. But the Indian meanwhile has the best result in the second half. Of course, Leko must not lose to him as White, but it turned out that Mark Glukhovsky, extremely acute person, is a better forecaster. He can tell also about Topalov and Svidler, if you ask. I can just share my considerations based on the tournament table observation. After the first half Petya was half a point behind and played White, now he is one and a half point behind and plays Black. It is clear that in the first half he had something to lose, so he lost, and now he has nothing to lose, so he will not lose. Is it logical? Let us notice, following yesterday's agreement, that Kasimdzhanov and Leko are no more candidates for the title, and we will wait to write Morozevich off, let his gap reach two and a half points with two rounds to go, and then we will write him off. And we will go on to the creative achievements of the 11th round. First of all I should say about the pleasure Topalov has deprived us of. After Ilya Odessky's praises to him Veselin had to provide the fans with the show and accept a piece sacrifice offered by Adams. The preceding and subsequent parts are thoroughly analyzed by Sergey Shipov, so I will examine only this moment. After 27...f4 28.¦xf4 Јxc2 I will mention «my own» variation just for a change – 29.¦f3 e5 30.¦g3+ ўf8 (30...Ґg4 31.Јxh5) 31.Јb4+! Јc5 32.Ґg7+ ўe7 (32...ўg8 33.Ґxe5+ Ґg4 34.¦xg4+ hxg4 35.Јxg4+ ўf8 36.Јg7+ ўe7 37.Јf6+ ўf8 38.¦f1 with mate is absolutely bad) 33.Јh4+ ўd7 34.¦d1+ ¤d6 35.¦c3, and White has a dangerous attack. In case of 27...¤h8 28.Ґxh8 ўxh8 29.Јf6+ ўg8 30.¦e3 h4 (30...Јxa4 31.¦g3+ Јg4 32.¦d1 looks dull) 31.¦xf5! exf5 32.Јxc6 ¦xe3 33.h3! seems more precise to me (in case of 33.ўg1, Black has a disturbing thrust h4-h3 in various lines) 33...Ґb7 (33...¦b8 34.Јd6 ¦b7 35.Јd8+) 34.Јxb7 ¦ae8 35.Јxa6 ¦8e6 36.a5 bxa5 37.Јxa5, and White gets connected passed pawns. A critical continuation is 27...Јc7. After 28.¦xf5 ¤h8 29.Ґxh8 ўxh8 30.Јxh5 Ґb7 31.¦f7 Ґxg2+ 32.ўxg2 Јxc2+ one can observe strong draw tendencies, but from my point of view, 28.Јxh5! is interesting. 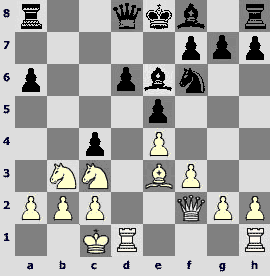 If Black replies 28...e5 29.¦f3 f4 30.¦xf4 Јxc2 31.¦f3, then the arising positions are similar to those after 27...f4. After 28...Ґb7 29.¦e3 the bad choice is 29...¦ac8, because White does not go for the queen immediately by 30.¦g3+?! Јxg3 31.hxg3 ¦xc2, but increases the tension by 30.Јh4! On 30...Ґxg2+ there is a haughty 31.ўg1!, and in case of 30...¤h8 Black is getting mated – 31.¦g3+ ¤g6 32.¦xg6+ hxg6 33.Јh8+ ўf7 34.Јg7#. This sad line makes one think about taking the rook off the e8-square –29...¦ec8! ?, and now 30.Јh4 ¤h8 31.¦g3+ ¤g6 is not dangerous. However, White can play 30.¦fe1!, preserving dangerous initiative. leads to the situation where material equality can be restored in two ways. The first one is 32.¦ff3 ¦a7 33.¦xg6+ Јxg6 34.¦g3 ¦g7! 35.Јf3 Јxg3 36.hxg3. Exactly two rooks for a queen, and Black has strengthened a bit. I would have preferred 32.Јh6! with subsequent h4-h5. White will have one pawn less, but what an attractive attack with opposite colored bishops! So, the conclusion is: Topalov was absolutely right (in his own way! ), when he sacrificed an exchange by 26...¤xg5. Let us leave our rightfulness for our own games. In this column I already amused myself with comparison of Kasimdzhanov's and Morozevich's creative methods of playing against Anand. Maybe, Rustam had to look more closely at the game played two days after his triumph, and make a conclusion that repeating the methods already tried is exactly what guarantees success against Anand. And in his case he would not have to imitate anyone: in his marvelous encounter with Svidler, Kasimdzhanov himself demonstrated a safe method of solving problems in the Sicilian defense. 1.e4 c5 2.¤f3 d6 3.d4 cxd4 4.¤xd4 ¤f6 5.¤c3 a6 6.f3 e5 7.¤b3 Ґe6 8.Ґe3 ¤bd7 9.Јd2 b5 10.0-0-0 ¤b6 11.Јf2 ¤c4 12.Ґxc4 bxc4. 13.¤a5!? This amazing maneuver that invites the queen to a mouse trap was used only once before. 13.¤c5 is the main line, which occurred for example in Anand-Svidler (Dortmund 2004), followed by 13...Ґe7 14.h4 Јc8 15.¤5a4 ¦b8 16.g4 Јc6 17.¤b6 Ґd8 18.¤cd5 0-0 19.c3 ¤xd5 20.¤xd5. Then the knight made a pirouette b4-a6-c5-e6, that allowed White to gain an advantage, but it has nothing to do with the opening. So, the bishop transfer f8-e7-d8-a5, well-known to Rustam since the day before yesterday, suited this scheme all right. 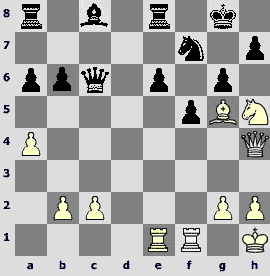 That is exactly the way Gelfand acted against Bologan, having seen 13.¤a5. Their game in the Spanish team championship developed in the subsequent way – 13...¤d7 (Boris did not fall into the 13...Јxa5?? 14.Ґb6 Јb4 15.a3 trap) 14.¤c6 Јc7 15.¤b4 Јb7 16.¤bd5 ¦b8 17.b3 cxb3 18.cxb3 Ґe7 19.ўb2 Ґd8, and Black got a good play (bishop moved to a5 on the 22nd move). And the FIDE world champion decided to search the new ways for some reason. 13...¦c8 14.Ґb6 Јd7 15.g3. 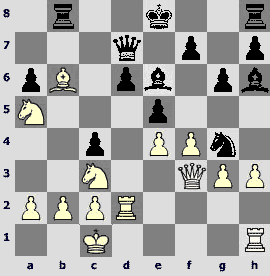 Skillful Vishy understood that by 15.¦d2 he would force the opponent to go for the right setup – 15...Ґe7 16.¦hd1 0-0. And he started muddling. 15...g6. 15...Ґe7 was still possible. This seems dangerous because of 16.f4, and now 16...Ґg4 17.fxe5 is bad, and White will meet 16...g6 by 17.¦hf1, reestablishing the status quo. Non-trivial bishop thrust to nowhere 16...Ґh3 helps to hold the position. 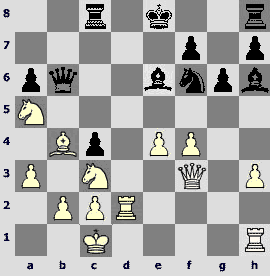 Konstantin Sakaev did not agree with Sergey Shipov's humorous assessment of Kasimdzhanov's novelty 18.Ґh5 (from the first half game with the same Indian opponent) – «He put the bishop away for it not to impede him». However, here it is exactly the matter. Black will meet 17.fxe5 with 17...¤g4 18.Јf4 ¤xe5 19.¤d5 with acceptable position, and there is 17...Јe6 in reply to 17.Јe1. 16.¦d2. 16.f4 is the alternative, but seeing that Rustam has already said «g», Vishy makes him pronounce the subsequent letter. 17...¤g4. His wish to place the horseman actively played a bad joke with Rustam. 17...¤h5 was even worse, because 18...exf4? 19.g4 loses after 18.¦hd1. One would have had to jettison the ballast – 18...¤xf4 19.gxf4 Ґxf4, and here White gets significant advantage, regaining a piece by 20.Ґe3 (it is better than 20.ўb1 Ґxd2 21.Јxd2) 20...Ґxe3 21.Јxe3 Јc7 22.¦xd6 Јxa5 23.Јh6. However, Black had a modest 17...0-0 18.¦hd1 ¤e8, protecting the d6-pawn. Yes, the black knight has locked the f8-rook this way, but did it really disturb Kasimdzhanov in the game with Svidler?! 18.Јf3 ¦b8. One could have returned – 18...¤f6, making use of the fact that neither 19.¦hd1 Ґg4, nor 19.fxe5 Ґxd2+ 20.ўxd2 dxe5+ could be played. The variations I will show subsequently are optional but beautiful. That is what I am here for, as a matter of fact. So, 19.h3 Ґxh3 (bishop is on the rook's bead) 20.Ґe3 (threatening 21.fxe5) 20...Ґg4 21.Јf1 (21.Јf2 Ґh5 22.Јg1 ¤g4 gives no promises) 21...¤h5 22.¤xc4 ¤xg3 23.Јg2. In case of 23...¤xh1 24.¤xd6+ ўf8 25.Јxh1 White has more than enough compensation, so... 23...¦xc4! 24.¦xh6 ¦xc3! After 25.bxc3? Јa4! White king gets epaulets с3 and e3 on his full dress – 26.Јxg3 Јxa2 27.¦xd6 Јa1+ 28.ўd2 Јd1#! 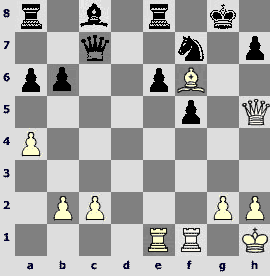 The only salvation is 27.¦e2 Ґxe2 28.ўd2 Ґc4, but here Black has two extra pawns and attack. 25.Јxg3 Јe6 26.ўb1! is correct (26.¦g2 again threatens the monarch: 26...Јxa2 27.Јxg4 Јa1+ 28.ўd2 Јxb2 29.Јd1 Јb4, and after 26.b3 f5 Black is better) 26...exf4 27.Јxf4 ¦c4 28.Ґd4 0-0. 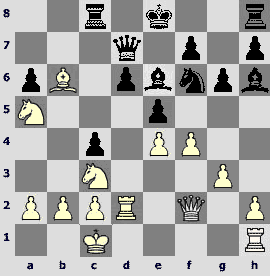 In this position Black has only one extra pawn, and White can build up some attack in prospects. 19.h3! Having assessed that 19.Ґc5 exf4 20.gxf4 ¤e5 does not give an advantage, Anand makes last preparations for the bishop move. 19...¤f6? In case of 19...¦xb6? 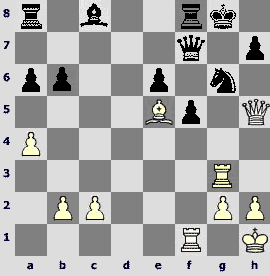 20.hxg4 black pieces could get in trouble – 20...Ґxg4 21.Јe3 or 20...Ґg7 21.f5. Still, Rustam had to reveal consistency. He had to spur the knight, if the latter was so enterprising – 19...¤h2! 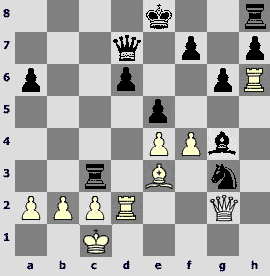 After 20.¦hxh2 one could safely take the device out – 20...¦xb6, and in case of 20.Јe3 or 20.Јf2 the race goes on – 20...¤f3! In Tripoli Rustam had been distinguishably skillful with knights, and in this game he went wrong. The rest of the game is easy. 20.Ґc5 exf4 21.gxf4 ¦c8 22.Ґxd6 Јd8 23.Ґb4!? Јb6 24.a3. How tenderly the piece chain from c1 to a5 is built! 24...¤h5 25.ўb1 Ґxf4 26.¤d5 Ґxd5 27.¦xd5 Ґb8 28.¦hd1 c3 29.¦d7. Black resigned. Sergey Shipov is puzzled: what was the knight doing during all the game on a5? We will understand it if we look more closely at his fellow's movements on another wing, and remember the most correct answer to global question, «What is the use of chess players?» The answer is, «We disturb no one, we just sit quietly and play our game». Considering what people do all over the world, it is not too little.